Son of Beast was once a record-breaking wooden roller coaster built in 2000 for Kings Island by the now busted Roller Coaster Corp of America. It was the world first wooden hyper-coaster and was the only wooden roller coaster in the world that had a loop. Now, personally I never got to ride Son of Beast myself and trust me, I'm pissed about it. However, I've learned a lot about it's shared history through friends, fans and the internet in general. I have to admit, it's a shame this amazing coaster paid the ultimate price for people being entirely too stupid to listen to the rules. In 2006 some kind of unknown 'track damage' caused a sudden stop in the ride. I've never really found much information on this 'accident' only that it's listed online. What I can tell you is it's blamed on "busted timber supports" for the ride, which is OBVIOUSLY something their repair crews and maintenance should have spotted during morning rounds and closed the ride until it was repaired. However, someone was being lazy that day which caused minor injuries to riders and was the first death bell for Son of Beast. Kings Island then removed the loop in 2006 and purchased lighter coaster trains, this had zero effect and really borked the ride beyond repair. I'm told when they removed the loop all the dynamics of the ride shifted and they had endless problems. Obviously, you can't just remove something and hope a ride will be alright! Anyone with a decent brain and a little common sense can tell you that! Personally, I suspect by 2006 Kings Island wanted Son of Beast gone and they were going to accomplish that goal one way or another. It's death blow came when some idiot claimed an unfounded and ungrounded 'head injury' in 2009. By 2010 the ride was closed, the name had been removed and it had been stricken from the park maps. They knew they where closing it, I suspect they'd wanted it gone for a while. By 2011, the park was unsure of the rides fate but stated they'd made no decisions yet. In early 2012 they were 'evaluating' the ride but still stated no decisions. 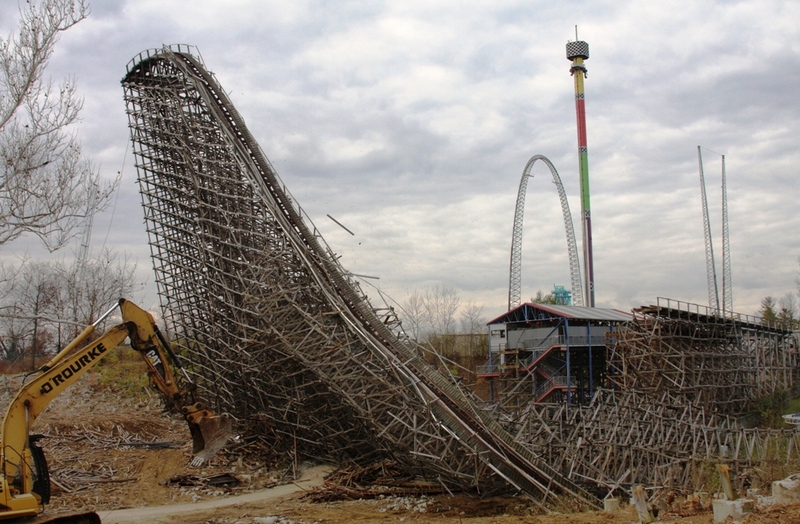 In July 2012 the news finally came, Son of Beast would be removed and by November of 2012 the demolition was nearly complete. If that image doesn't hurt you to look at, your a stronger person then me! That's the multi-million dollar question, isn't it? It's pretty obvious now that Kings Island wanted Son of Beast gone in a bad way. It hasn't even been a full year and they've already got construction wall up and hints laid out about a new ride coming soon. 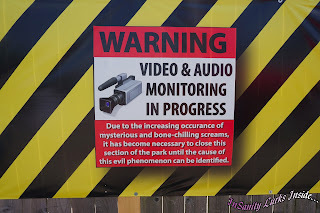 We just visited Kings Island last weekend and being very nosey people, we wanted to know. Naturally no one official will be answering questions until their ready to really begin dropping hints to the general public (and we hope to bring you those hints when they begin). However, I can tell you a few little facts about what Kings Island is up to on the burial site where Son of Beast one stood. Already, they've got something going into this space. 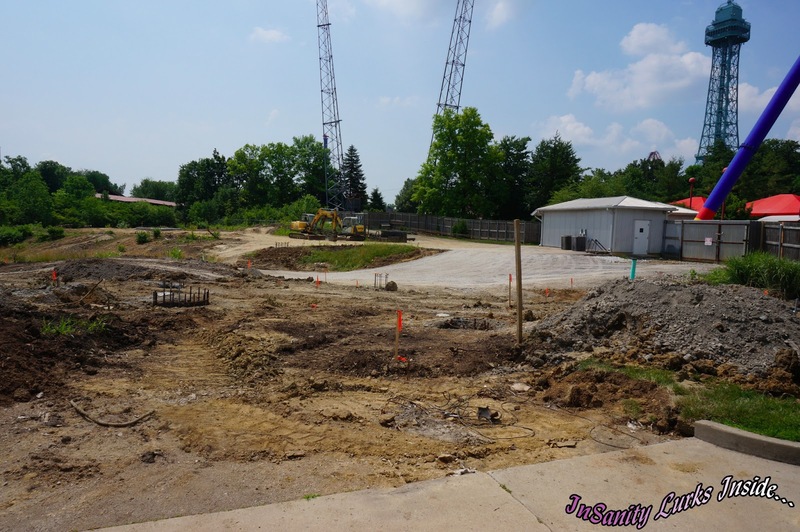 If you make that image larger, you can clearly see new ride footers being placed. These initial pourings appear small but they go back a very long way into the fenced off distance. Lot's of marker flags are placed in some pattern we couldn't discern and plenty of equipment litter the backstage area. Honestly, we don't have a damn clue what is going in. Nothing has been reported (never fear, I'm still searching online for the permits I know must be there!) and the park isn't talking to anyone yet. However, if you keep your ear to the ground and an eye on the huge gossip chain, we may be looking at the beginnings of a new roller coaster! Rumor states that a new coaster of an unknown type will be built on the grave of the Son of Beast. The rumored opening date is the 2014 season. Personally I think these initial footers seem too small for a coaster of any size but then something dawned on me. Most wooden coasters have support wires for key elements, the footers found in the pictures just happen to be around the right size for those! Revenge of the Son of Beast, perhaps?! 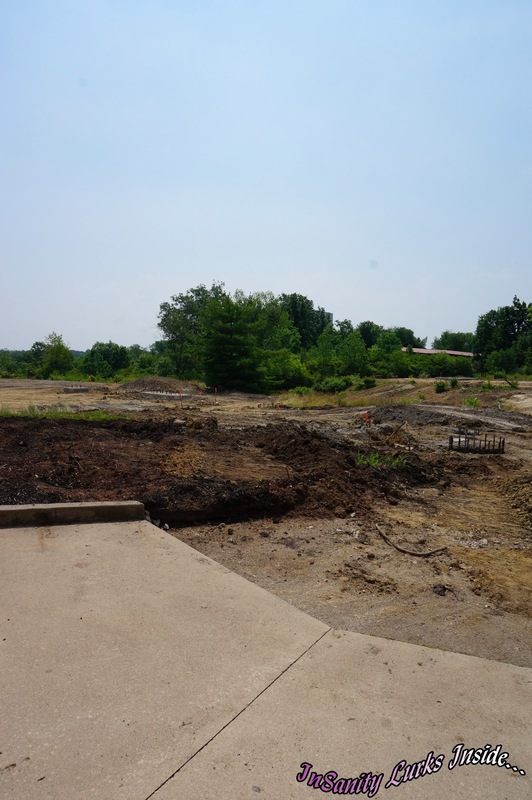 So honestly, I can't tell you for certain what Kings Island is doing with this prime chunk of land but I can tell you that they are up to something. Something that's at least decent sized and requires some suspicious looking footers! I've asked to be kept informed of any news regarding this new attraction (please let it be a coaster!) and whatever I'm able to learn will be passed on to my readers! 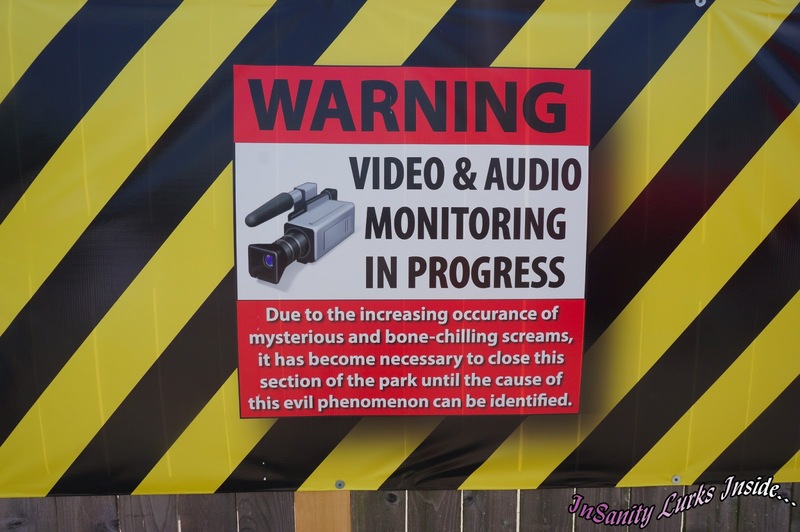 Be they from the park themselves or from the rumor chain, we're going to follow this one pretty intensely! 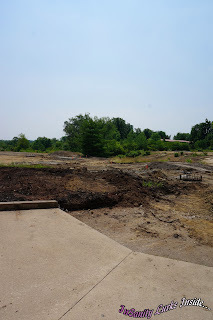 It's my hope that Kings Island will give us a worthy replacement to Son of Beast but until we know for sure what this park has stashed up their sleeves (now would be a GREAT time for google to do a fly-over by the way, we can see what they have stashed in the background! ), all us coaster-fiends out there in internet land can do is cross our fingers. If you have any news or rumors, please, feel free to post them in the comments! If you'd rather not be identified then you can email me at Insanitylurksinside@gmail.com. Any and All news is welcome as well as your photos on continuing construction! Until then, we hope you enjoyed our photos and the little history lesson/rumor patrol/speculation session! We'll be posting updates as information comes to us so keep an eye out!